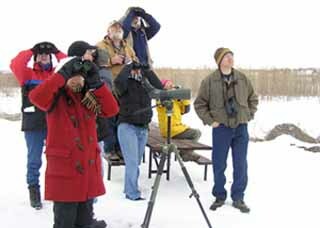 For over 100 years citizen scientists have participated in one or more Christmas Bird Counts. The counts began as an alternative to bird hunting over the holidays and their popularity has grown over the years. Many counts have years of data available which provides an interesting look at changes in the wintering birds and the landscape. Current season counts for Nebraska are listed as they are received. If yours is not listed, please send details to the Webmaster by using the contact form at the bottom of each page. Counts are conducted each year for one calendar day from December 14th to January 5th. For more information on CBCs, and to see the data for our counts as well as others, please visit the National Audubon CBC site. Click on the map icon for a printable count map and on the compiler's name to send a message. If you would like to participate contact Joel Jorgensen. The Seward-BOL CBC circle includes all of Branched Oak Lake, most of Twin Lakes, the west end of Pawnee Lake, all of Meadowlark Lake, two WMAs and lots of good road driving with bridges over creeks and wooded areas.. Please email of leave a phone message 402-641-4641 if you are able and willing to help for all or part of the day. You can contact Duane Wolff 402-841-0130 or Dave Heidt for more information if you would like to participate. Meet at Arby’s at 7:00am. Count sites will be assigned at this time. Please contact Kathy DeLara if you would like to participate. Please contact Jason at 402-750-0660 or email if you would like more information or are interested in participating. **NOTE DATE CHANGE** We'll meet Saturday, December 29th at 6:00 p.m. at Valentino'sPizza in Ogallala to make area assignments. Please let Steve know beforehand if you plan to attend. This is always a great count! Please contact if you would like more information or are interested in participating. If you want to participate, please contact Kathy DeLara renosmom@ charter.net to get an assigned area.